Seriously? There is a Motel 6 down the road. They'll leave the light on for you. I've been camping for over 60 years. I never thought in a million years I would ever hear of campers who complained about campfires and the smoke. Of course when the wind changes everybody shifts around to get out of the smoke. I love smelling the smoke on my clothes. The absurdity of it reminds me of the Dr. who built a new house across the road from a 200 year old pig farm. He complained because his family couldn't enjoy being out in his yard because the pigs smelled so bad. After all he thought the farmer should be considerate of his new neighbor. WHAT? He thought the farmer should have to do something about it. He actually took the farmer to court. The judge said it was the most rediculous lawsuit he had ever heard and threw it out. I like campfires so much I'll sit around the fire in my rain gear if I can keep the fire going. It's a sign of the times. "It's all about ME." 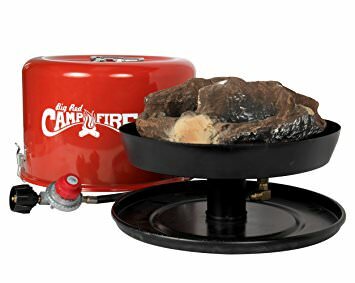 And actually, I really like campfires too, this is just easier to use and less messy/hassle....guess I'm getting old and lazy. Excessive Payload Capacity is a Wonderful Thing!